The strike centres on pay for newly-qualified teachers. 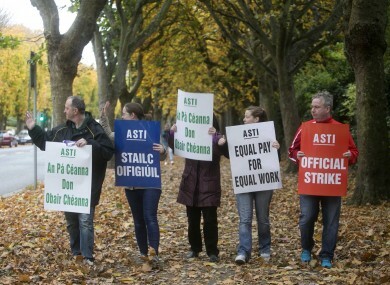 AROUND 500 SECOND-level schools will be closed today as ASTI teachers go on strike. Talks between the union and the Department of Education ended on Sunday with no agreement and many schools closed yesterday when teachers withdrew from supervision duties. Teachers want more recently qualified teachers to be paid on the same scale as their colleagues. Yesterday, ASTI General Secretary Kieran Christie told RTÉ’s Six One that the union was open to the dispute going to the Workplace Relations Commission. Schools where a majority of teachers are members of the Teachers’ Union of Ireland will be open as normal. The ASTI has argued that the current pay scale disparity means that teachers who qualified after 2011 start on salaries 20% lower than those of their counterparts. However, Education Minister Richard Bruton said that if the union signs up to the Lansdowne Road Agreement, new teachers will see pay restoration of between 18% and 22%. Email “Around 500 secondary schools closed today as teachers strike”. Feedback on “Around 500 secondary schools closed today as teachers strike”.